Reduce, Reuse, Recycle! Recycling is something that most of us know we should do, and we could do more of. So, what's stopping you? Is it a struggle to keep your recycling efforts neat and tidy? Do you think it will take too much time? Recycling can be simple and convenient if you pick the right tools and know the rules. Creating a station and system in your home can help to integrate recycling into your everyday routine, making it an easy task for all members of your family to keep up. Most of our waste comes from the kitchen, so that is a good place to start. Are kitchen tables and counters a dumping ground for junk mail, magazines and newspapers? Pick a drawer unit or bin that you do not mind having out in the open to help keep you organized. Sterilite's Medium Weave 3 Drawer Unit is a great solution for clearing up the clutter. It will be easy on the eyes and simple for family members to put things where they should go. 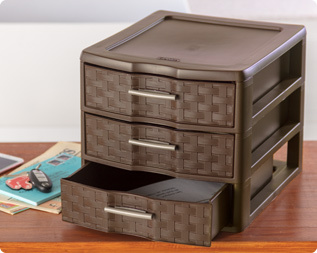 Try using this as a mail sorting system – one drawer for bills, one for coupons and one for magazines. 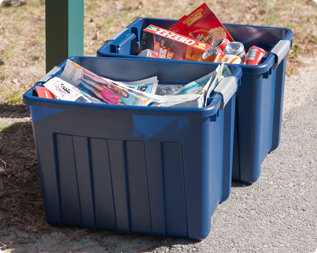 Keep a paper recycling bin handy to toss out junk mail right away. The natural weave aesthetic will compliment most kitchens and provide a 3-drawer solution that will fit most daily mail. Do you need to sort your recyclables? Some towns require it, while others do not. Open wastebaskets make it easy to sort your bottles, cans and paper products as you use them in the kitchen. 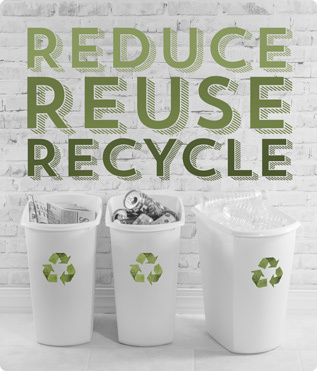 If you have the space to dedicate all your recyclables, use two or three containers to best suit your needs. Wastebaskets make ideal collection bins, as they are designed to take up minimal floor space. The 5.5 Gallon Rectangular Wastebasket features handles integrated into the rim to provide a comfortable surface for lifting and transporting recycling to outdoor containers. In some towns, you can leave your recyclables in bins outside your home and they are collected regularly. Other towns have recycling centers for you to drop items off. Residents in some areas face fines for not recycling, so be sure to find out! If you have curbside pick-up, some towns provide containers, while others require you to supply your own. The 18 Gallon Ultra™ Totes can withstand the elements making them great for curbside pick-up. With their lids latched on tight, it is easy to stack them and transport them in your car to the recycling center. Recycling benefits everybody, and one person really can make a difference. With a little sorting and the right system, recycling doesn't have to be a chore. The Sterilite Medium Weave 3 Drawer Unit is the ideal decorative solution for hiding clutter from the mail with its opaque drawers and stylish weave pattern. The slim profile, glossy finish and integrated handles of the Rectangular Wastebaskets make them ideal for collecting and sorting waste in any room. The 18 Gallon Ultra™ Tote is rugged, impact resistant and cold-temperature resistant. Heavy-duty latches secure lid to base and the design allows for stacking.